April 9, 2010 - NTSB Chairwomen Deborah Hersman has indicated to the Federal Aviation Administration (FAA) that the agency needs to do a better job in support of search and rescue (SAR) response to aircraft accidents. In several recent accidents, information readily available to FAA staff was either not well communicated or not made available to the Air Force Rescue Coordination Center (AFRCC) in a timely manner. The Air Force Rescue Coordination Center (AFRCC) has responsibility for initiation and coordination of SAR activities in the domestic United States. When the AFRCC receives information that a new accident or incident requiring SAR response has occurred, AFRCC personnel assign it an incident number and begin to obtain all available information about the flight. Each significant event or contact during the search is recorded in a chronological mission log. The AFRCC coordinates the activities of the searchers and serves as a clearinghouse for information. It continues to track the mission until the aircraft is located or the search is suspended pending additional information. The following accident illustrates some of the problems with communication between FAA air traffic controllers and AFRCC staff. On April 26, 2007, about 1430 eastern daylight time, a Piper PA-38-112, N9247T, crashed into trees and rising mountainous terrain at Amicalola Falls State Park in Dawsonville, Georgia, while attempting to stay below overcast cloud conditions. The certificated commercial pilot, the sole occupant, eventually died as a result of the accident, and the airplane sustained substantial damage. The flight was operated as a personal flight under the provisions of 14 Code of Federal Regulations (CFR) Part 91, and no flight plan was filed. Instrument meteorological conditions prevailed near the accident site. The flight originated from Habersham County Airport, Cornelia, Georgia, about 1400, destined for Lunken Field, Cincinnati, Ohio. Evidence indicates that the pilot likely survived the accident and activated an emergency transponder code but died before the airplane was located. Shortly after the crash, controllers at the Atlanta Air Route Traffic Control Center (ZTL) noticed an unidentified stationary radar target about 50 nautical miles (nm) north of Atlanta. Beginning about 1534, the target transmitted transponder code 7700, which is a dedicated emergency code reserved for use by aircraft in distress, and its use by the accident pilot caused a special flashing "EMRG" alert to appear on ZTL radar displays. About 1552, the ZTL traffic management coordinator (TMC) notified the AFRCC of emergency locator transmitter (ELT) reports and observation of the 7700 code. During the call, the TMC stated that there were ?numerous ELT reports?north of Atlanta? and that he did not believe that an incident number had been assigned. At the AFRCC controller?s request, the TMC provided the information in the ELT reports, and the call concluded. The AFRCC controller did not provide an incident number to the TMC, which would have indicated that she understood that the TMC?s report indicated a new incident. Rather, she associated the report with the incident south of Atlanta. Once the report for the incident south of Atlanta was closed, that also ended any activity related to the ELT reports and radar observations north of Atlanta provided by ZTL?s TMC. Thus, no SAR effort was begun for N9247T until family members reported the accident airplane missing the following day. As there was evidence that the pilot survived the crash, this was a critical SAR failure. Based on the family's report of the missing airplane, the Dayton, Ohio, Flight Service Station (FSS) issued an Alert Notice (ALNOT) about 1247. According to the AFRCC?s mission log, the AFRCC began attempting to locate the airplane immediately upon receipt of the ALNOT. Air searchers located the airplane about 49 hours after the accident, and the ground team arrived shortly afterward. 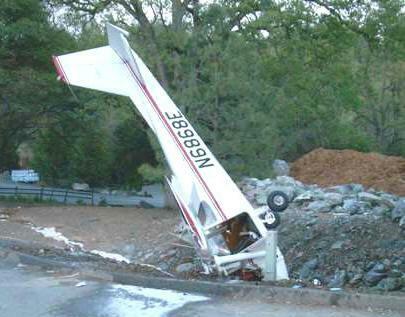 The team reported that the pilot was deceased. During the search, the AFRCC activated Civil Air Patrol (CAP) wings in four states, coordinated information gathering activities with numerous FAA air traffic control (ATC) and Lockheed flight service facilities, and obtained radar analysis assistance from CAP and U.S. Air Force (USAF) air defense personnel. The extensive effort was necessary mainly because the AFRCC controller did not understand the FAA?s communication about the existence and location of the 7700 emergency signal being transmitted by N9247T. In postaccident discussions, AFRCC management said that the AFRCC controller who took the call from the TMC believed that the reports being provided were related to the existing incident reported south of Atlanta, so she did not open a new incident in response to the TMC's call. The lack of standard phraseology for communications between FAA and AFRCC personnel about particular observations, such as the observation of an emergency 7700 transponder code, clearly hindered the SAR effort in this event. Therefore, to ensure that incidents reported to the AFRCC are tracked to closure, the NTSB recommends that the FAA require ATC facilities to enter all AFRCC contacts on FAA Form 7230-4, ?Daily Record of Facility Operations,? and, in circumstances where that contact results in the AFRCC assigning a new incident number to the event, require facilities to contact the AFRCC at least once per shift for a status update until the AFRCC advises that an incident has been resolved. The first priority following a suspected accident must be to immediately locate the aircraft and rescue any survivors. The NTSB recognizes that physical SAR is not an FAA responsibility, but the FAA is frequently the first organization to become aware that an aircraft is missing, and FAA facilities normally possess recorded data that could rapidly assist first responders in locating the accident site.